Julia Phillips proves that life ain’t over after having a baby. I WAS WARNED that life would never be the same after I became pregnant with my first child. Acquaintances seemingly found satisfaction in informing me and my husband of all the things we would no longer be able to, including travel. After our daughter’s arrival, we learned they were right about one thing: life has changed forever. Our days are filled with more laughter and love than we thought possible. And some of our most memorable moments have unfolded as we share one our favorite pastimes with our daughter: outdoor travel. Anna had been walking for one month when we decided she was ready to take on a biking and camping trip along the Greenbrier River Trail in wild West Virginia. Her budding vocabulary included words like bike, cat, and the sign language for rain, but she had no idea how intimately she would encounter each of these over the next four days. The Greenbrier River Trail is part of the Rails-to-Trails system, in which old railroad tracks are converted to trails for recreational use. The 78-mile long path is wide and flat — a 1% grade — and winds along one of the most scenic rivers on the East Coast. 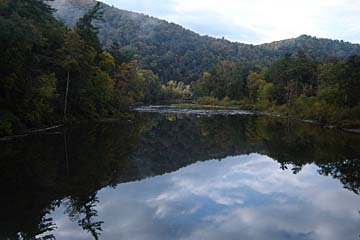 The water offers opportunities to swim, fish, and canoe in warm weather. The trail is lined with 12 camping sites and even more picnic tables. Many of these sites also have restrooms, which we found clean and well supplied. However, only select sites provide potable water, making it necessary for overnight campers to refer to a trail map and ration out their water supply. We planned our trip for the last week of fall for the autumn colors. Preparing was fairly basic. All we needed was a map, decent weather, and a backup plan in case Anna was not an enthusiastic camper (plan B was to carry the phone numbers of bed and breakfasts located on our route). We started at the trail’s southernmost end in a town called Caldwell. We squeezed into the packed parking lot and unloaded our gear onto the bike trailer. An hour later, 40 pounds of supplies — from diapers to Raman noodles — were deftly balanced on the trailer. We hooked up Anna’s “Bob Chariot” to the back of our other bike. 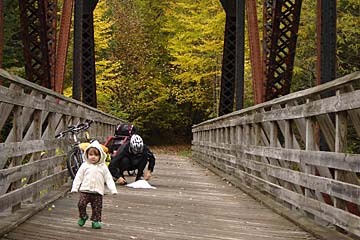 We placed our happy one‐year‐old inside and began to pedal, just as it began to rain. By the time we had traveled nine miles to our campsite, the rain had subsided to a drizzle. We quickly set up the tent and made dinner before putting Anna to bed. The next day, morning light revealed colorful mountains and we were eager to experience this wilderness with our daughter. During the course of our four‐day trip, we cherished watching Anna watch the world. She pointed excitedly at hundreds of migrating geese and laughed at the coldness of the river water on her legs. She even helped with the meals, meticulously transferring green pepper pieces into a pot of hash browns. Anna’s flexibility and agreeable attitude made us all happy campers. However, on the second night, our sense of adventure was stretched slightly beyond our comfort level. As my husband and I sat by the campfire, Anna began to cry from within the tent. Another voice echoed back from a nearby tree. It was a bobcat, mimicking her wailing almost perfectly. The night was dark and lonely and the crowded parking lot seemed far away. Stay at a local B&B. Car camp at Watoga State Park. Rent bikes and make day trips along the Greenbrier River Trail. Walk in with a picnic and spend the afternoon swimming and fishing. If your time on the trail leads you anywhere near the town of Seebert, be sure to stop by Jack Horner’s Corner store. Our weary biker legs enjoyed a well‐earned hot pizza there. You can also take the family to the historic Cass Scenic Railroad at the northernmost end of the trail. Kids can experience a ride on the train and an inside peek into an important part of America’s past. However you decide to experience the Greenbrier Valley and however many children you bring along, the region offers adventure, natural beauty, and an opportunity to be together. As our legs pushed our family across miles of gravel, we became a part of the red, orange, yellow, and blue landscape. I’m happy that life has changed me from a mountain biker into a trailer‐toting mom. Sharing the stars and sticks with someone seeing it all for the first time is a joy. 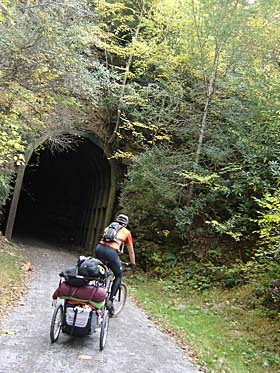 For lodging, check out Greenbrier River Trail services. Outfitters offer services such as bike rentals, shuttle services, canoe rentals, and guided fishing trips. For specific price quotes, call Elk River Touring Center (866‐572‐3771) and Appalachian Sport (304‐799‐4050). For more tips on getting on the road with the little ones, read What Every Parent Should Know About Traveling With Their Kids. Then follow that up with The Educational Value of Long Term Travel With Kids.